The LUMI PAD15-01, anti-theft tablet desk stand with lock, is designed for securely displaying a tablet. Width adjustable to fit iPad 1/2/3/4/Air, most 9.7”-10.1” Galaxy and other tablets. The case is designed with home button covered, preventing the use of the home button. Cable management inside the stand tube. Can this tablet desk stand hold tablets in both portrait and landscape orientation? Yes. 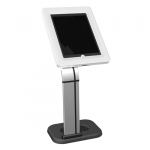 This stand has a locking system that can hold a tablet in either a portrait or landscape orientation.